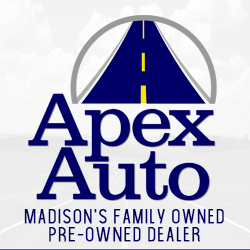 Apex Auto is your Family Owned dealership at 3074 East Washington Ave, Madison WI. Apex Auto was started in 2016 by Michael McKinley and Timothy O’Connell. The idea behind Apex Auto is that we want to make it easy for customers to find the car they always wanted at the best prices on the market. And that’s exactly what you can get when you work with us. We have more than 30 years of combined experience in the industry, and we know the ins and outs of car dealerships. We also know the industry tricks, and we want to help customers pay the best price for the car they love the most. And with our help you can totally do that. What makes Apex Auto stand out is that we always bring in front the best deals on the market. We also remove those old school tactics while also bringing in a millennial perspective. We offer the right assistance on social media and online, but also on-premises. We believe there’s a great car for everyone, and we will use all of our experience and professionalism to help you as fast as possible. Since we are using professional, unique tactics, you can rely on us to offer the efficiency and value that you always wanted. We are a quality and integrity focused business. And since we are a family-owned business, we value the importance and happiness of every family. Apex Auto is one of the few dealerships out there focused on offering the ultimate experience for every customer. And with our help you can easily obtain the best quality and value that you can find on the market. Apex Auto doesn’t upsell you, instead we do everything to help you make the most out of your budget. We know your budget is limited, and that’s why we want to make the process convenient, and all of our prices are a lot lower than the competition as well. It’s very important for us that every client leaves our store with a smile. If you want to get the best deals on a huge range of vehicles, all you have to do is to get in touch with us today. Our store is opened most of the week, and you can also send an inquiry online. Our team is always happy to provide you with the help and assistance you need. Just get in touch with us today!